SmarterMail delivers Exchange-level mail server features for a fraction of the cost. With lower hardware requirements, superior stability, and reduced maintenance costs, SmarterMail has much lower Total Cost of Ownership (TCO) and is the best-in-class Microsoft Exchange alternative for businesses and hosting companies. Our SmarterMail Email Hosting can give you a great value for a low-cost. SmarterMail is an excellent hosting solution for your email needs! 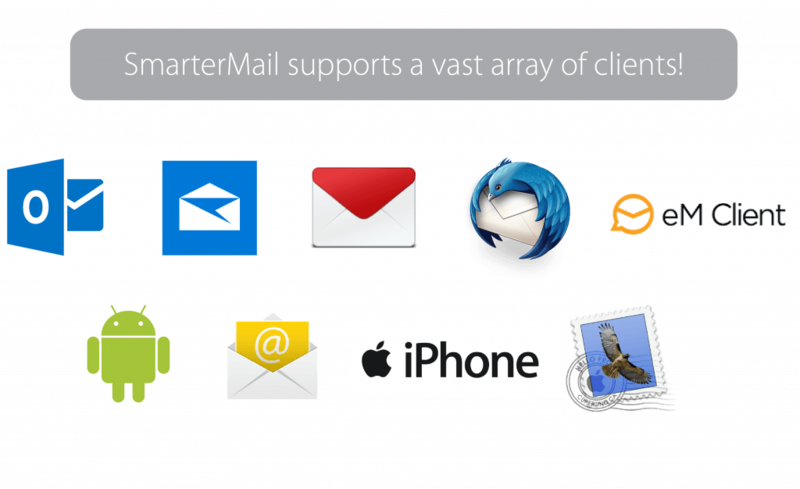 SmarterMail is a fully packed feature rich Enterprise Level Email & Messaging server! With one of the best web interfaces offered by a mail server, we are sure you will be blown away by the SmarterMail interface and its abilities. All powered by the all new and completely redesigned SmarterMail 17! We rely on many methods to stop spam from reaching your inbox. We know how important it is to keep your mailbox clutter free from these annoying emails! We utilize Arm Research Labs, Message Sniffer. Message Sniffer utilizes cloud-like technology that combines mail servers all over the world to create signatures, patterns and even advanced machine learning technologies to score and process email messages. Technologies such as SPF and DKIM also help filter and identify spoofing attempts and further assist limiting the amount of junk your mailbox sees! We also rely on real-time IP blacklists like Spamhaus, CBL, Barracuda, GBUDB, SenderScore and others to block known spammer networks, compromised mail servers and known spammer mail server addresses as well as URI blacklists such as URIBL and Spamhaus to filter emails that contain known bad (spam, malware, phishing etc.) URLs and hostnames. To protect your mailbox from viruses and malware, we use the power of Emsisoft’s scanner, which uses the award winning and world-renowned Bitdefender scanning engine along with custom signatures to ward off viruses, malware and zero-day infections! Screenshots of the SmarterMail interface will give you a quick idea what the user interface looks like. If Screenshots are not enough, we offer a live demo where you can sign into our SmarterMail system and explore the user interface, features and other aspects of SmarterMail. In the unlikely event that something goes wrong, our hosting website offers multiple (US and EU based) backup mail systems for redundancy. This way you never miss an email! In the unlikely event that our primary email hosting server does go down, our backup mail servers will instantly start taking and holding all the incoming mail, once the primary server is back online all held email will be delivered. SmarterTools has developed one of the most stable, efficient, high-performance email server solutions available! Still not convinced? Let our publicly available live server stats do the talking! To make it easier for our new customers, we offer you the ability to pay for only what you need! Pricing for SmarterMail accounts are priced at $0.10 per account, disk space is simply priced at $0.25 per GB. ActiveSync and Email Archiving are available as optional features which you can order during the checkout process. We offer the following addons to enhance your SmarterMail experience! SmarterMail includes a built-in utility for easily migrating your email from your current provider to our services. Many services have built-in support for migrating many features such as Microsoft Exchange, Google (Gmail), Yahoo! 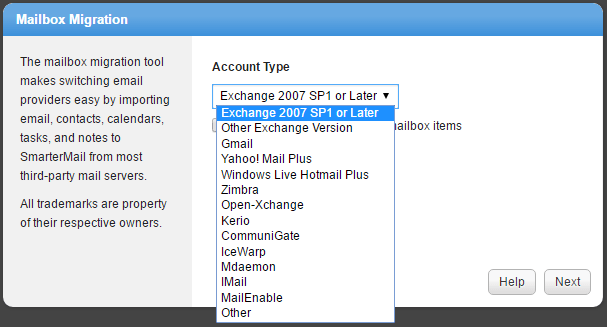 Mail Plus, Windows Live Hotmail Plus, Zimbra, Kerio, MailEnable, Icewarp and many others! Don’t see your mail server in the list? No problem, SmarterMail can migrate email from any service or server that supports POP3 or IMAP! We’ve handled mailboxes as large as 100GB and migrated them with ease! ASPnix uses a heavily modified version of WebSitePanel to allow you to easily manage your email accounts, aliases, groups, lists, ActiveSync accounts and more! Our Control Panel also offers a public API where customers can programmatically manage email objects with ease! Aspnix.com is good choice for asp.net hosting! I have been with ASPnix for about 4 months now and it’s a good host, since I haven’t had to use customer service once. The reason for this is they always post announcements on their blog proactively and I always get maintenance alerts.